BOSTON – December 5, 2018 – SumTotal Systems, a Skillsoft company, today announced further innovations in its award-winning suite that deliver enhanced Human Capital Management solutions across the entire employee lifecycle. The latest version of the suite builds on SumTotal’s laser focus on ease-of-use through an engaging, compelling and consumer-led user experience. The release also expands on SumTotal’s industry-leading solutions with enhanced configuration choices across the suite to help tailor the experience even further to meet the varied business needs of global customers. 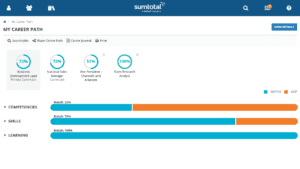 The latest SumTotal suite delivers powerful enhancements to the employee lifecycle with a new state-of-the-art, intelligent career development and career pathing functionality. Enhanced personalization tools powered by machine learning enable employees to highlight skill gaps and develop themselves for their current role and future aspirational career roles driving more engagement and increased retention. SumTotal’s My Career Path dashboard assesses an employee’s current skill set and suggests related job roles. Engaging Candidate Experience: The candidate experience is being further improved with our new smartphone-optimized e-signature functionality powered by HelloSign. SumTotal delivers faster recommendations for jobs and candidate pipeline building, based on real-life career movement. Recruiter Productivity: The suite uses machine learning to automatically build pipelines of internal and external candidates and auto disposition of candidates to make recruiters more efficient and effective. Learner Engagement: SumTotal further improves the intuitive, engaging and compelling learner experience with a redesigned registration experience. Mobile Enhancements: This release delivers more powerful tools that reduce time while delivering a more dynamic learning experience, including e-signature capabilities and support for curriculum registration on mobile devices. Employee Development: Employees can measure themselves against their current jobs to see what areas of development they need to match the expectations of their role. They can also search for aspirational jobs and create personalized development plans with milestones, to help prepare for the next step in their career. Employee Retention: This release further improves the visual delivery of goals and flexibility of continuous feedback, including leveraging templates and ad-hoc questions in SumTotal’s unique 1:1 continuous feedback journal. Compliance: Two of the top compliance issues facing organizations relate to Family Medical Leave Act (FMLA in the United States) and employees not being correctly paid for overtime that they have worked. Both these areas of compliance have been enhanced in this release to provide customers with the required framework for compliance. Engagement: Gamification provides a way to assign points and badges for actions and behaviors an organization would like to encourage. In this release, those abilities have been extended to occurrence tracking to engage hourly workers further. To learn more about SumTotal’s unified, comprehensive and flexible Human Capital Management suite, visit www.sumtotalsystems.com.